We source our fruit from farms around Georgia as well as around the country to identify the highest quality and most interesting varietals. Our aim is simply to create wines that we ourselves want to drink so that every person that takes a sip can taste that our full hearts went into every bottle. A sparkling apple wine made with fruit sourced from Mercier Orchard in Blue Ridge, Georgia. This is a light crisp wine with a clean finish. It was bottle conditioned to ensure smaller bubbles for a smoother texture on the tongue, and unfiltered to create a creamier mouth feel. Winner of Silver in the 2018 Georgia Wine Trustees Challenge for the Sparkling category. Just like our Winter Harvest Insider this bubbly wine was made with Georgia apples, but was fermented and aged in an oak barrel for 6 months, thus giving a bigger more rounded body and a more golden color. The subtle spiciness of the oak speaks well to the crisp acids of the apple to make a balanced sparkling beverage with a long finish. Available by the bottle only. Done in a softer style with more body and aromatics this wine has strong tropical notes like like pinapple and cantaloupe with a lemon zest and mineral undertones. Well rounded and clean finishing this is a very drinkable dry white wine that has proven one of the crowd favorites. Made with fruit from the high plains of Lubbock, Texas, this traditional Spanish white grape varietal is a gloriously balanced wine. From the nose and front palate your are met with a fresh bright citrus note that then transitions into a beautiful fruit balance of peaches and pears. Well suited to drinking on its own or paired with a light salad, cheese, or fish meal, we couldn’t be prouder to bring you one of our favorite wines we have ever produced. This is a classic blend of Georgia Wildflower Honey mead and Georgia grown apple wine with a slight amount of sugar to fill out the mouth feel. The round powerful body and nose of the mead balances beautifully with the high acid profile of the apples to create a bright easy drinking honey flavor. Made from 100% Georgia Chambourcin (80%) and Blanc du Bois (20%) this is a juicy easy drinking dry rosé. The nose holds floral characteristics that then rolls into a deeply tropical body filled with notes of grapefruit, kiwi, and bananas. With a strong and unique color reminiscent of rose gold in the Gold City of Dahlonega, Ga we welcome the arrival of our first Accent Cellars rosé. Perfect when slightly chilled and paired with a sunny summer afternoon. Winner of Gold in the 2018 Georgia Wine Trustees Challenge for the Rosé category. Made with 100% Georgia Chambourcin grapes this wine has a refreshing smoothness with strong notes of vanilla and a slight floral characteristics typical of the varietal. 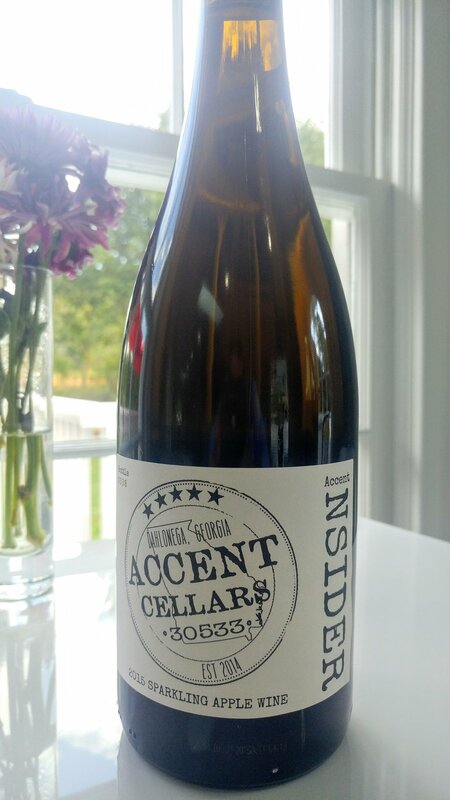 We made this one in an off dry style to bolster the mouth feel making it into a very unique member of the Accent wine family. With fruit obtained from Lodi, California and done in a medium bodied style this wine is packed with raspberry and spice in the nose and body. Earthy and jammy on the palate it can pair beautifully with just about any dish. The new American oak used to age it gives it an edge that makes it fuller than the color alone would suggest. Now under 10 cases remaining, this beauty is for sale by the bottle only. Sourced from the Russian River Valley in California and aged 2 years in oak and over 2 and half in bottle this is a beautifully smooth wine. It has a powerful aroma with a nice body that has notes of blackberry and licorice spice along with dark chocolate. With its mellow tannin profile this is an easy drinking wine that still packs plenty of flavor and is sure to please any fan of Cab. Sourced from Lake County, California, this Merlot is brand new to bottle and so just starting its second phase of the aging process with plenty of potential. It has notes of cherries with some floral tones on the nose and a body full of darker fruits like plum and raspberry mixed with licorice on the body. Though young and possessing a slight tannic edge this is a solid wine from a classic grape. 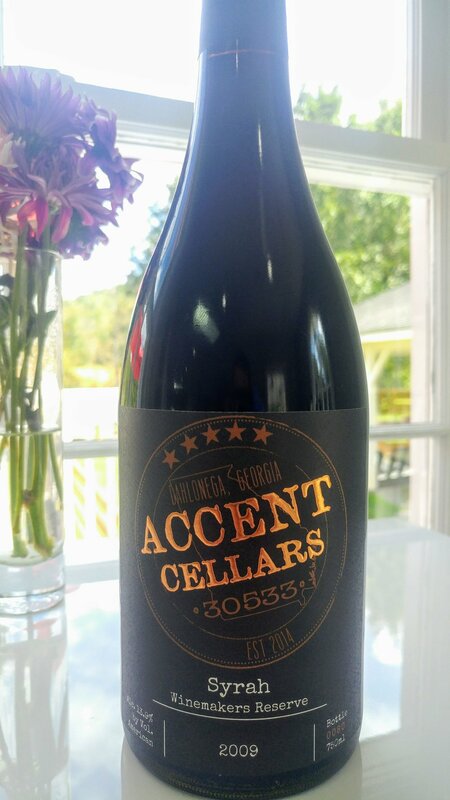 This wine was produced by our good friend Sarah Hunt using grapes from the same farm as Accent’s 2013 Cabernet Sauvignon in Russian River Valley out in Sonoma County, California. In need of good home we began carrying this wine in May of 2018. It is a very savory wine weighing heavier on the earthy rather than fruity side. Aged using all new American Oak, it is has a light tannic edge. Perfect for pairing with almost any meal, we welcome this classic varietal with fresh american take. A unique white port wine made from 100% Georgia apples, possibly one of the only wines of its kind. It was naturally fermented to 16% alcohol and then fortified to 17% with a slight amount of French Cognac, and slightly sweetened in line with a traditional port wine using apple concentrate. Full flavors make for a smell of black truffles and roasted apple on the nose, and strong notes of caramel dipped apples and cinnamon notes on the body, backed up by a slight smokiness provided by the Cognac. Perfect for an after dinner beverage or with a cigar. It is remarkably smooth and has at least a decade of aging potential. It is a limited 45 gallon run and so is in short supply. Made during an internship by co-founder of Accent, Tristen Vanhoff out in Sonoma California, this big smooth beauty was put into 5 Hungarian and French oak barrels before returning to Georgia to reunite with his wife. Lacking the funds to bring the barrels across the country, his mentor agreed to look after them for a while. About 5 years later in 2014 Tristen teamed up with his brother in law Tyler Barnes to start Accent. So equipped with a gracious loan from Tristen's mother, the two were able to bring the wine over, buy bottles and labels and had 120 cases of premium well aged California wine. Wholesaling all but 35 cases they were able to use those funds to purchase the rest of their fruit and juice for making the other flagship wines that eventually came on offer with the opening of their farm winery Accent Cellars off Auraria Road in Dahlonega. An excellent showcase for how well a Syrah can age, it is silky and big with a finish that lingers luxuriously in the back of your palate. A must drink for any fan of bold red wines.